The bubbles are at it again. 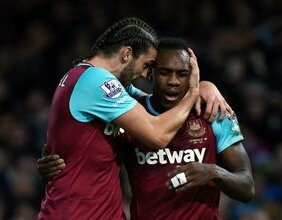 Andy Barnet has elected to go with a Heidi-style platted look, while Alex Song is warming the bench resplendent with Bono-style goggles! But the big news is that Michail Antonio is on the terror trail again, rampaging at every opportunity and has given the bubbles boyz the lead. Dimitri Payet is waiting in the wings...could this be the double!! !